The new integrative environmental station operated by the National League for Bird Protection sits next to the sailing center on the Grossen Rothsee (Large Rothsee Lake). Whether on the climate-deck, the clouds cinema, behind the bird spy or in the water-mud-area: the environment station offers many opportunities to learn about the exciting animals and plants of the Rothsee. Summer and winter, spring and autumn the National League for Bird Protection (LBV) runs a conservation pavilion, which is open from 1pm to 5pm at weekends from April to October. There you will find a small exhibition about habitation on the lake, You can also purchase information brochures, field guides for plants and animals and other materials for environmental education. 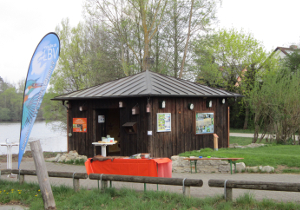 As part of their promotion the Fisheries Mittelfranken has developed a concept for a fishing trail for the Rothsee lake.